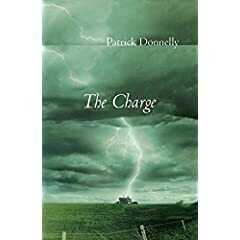 The title of Patrick Donnelly’s The Charge can mean many things: attack, task or obligation, the current or life force that runs through us all, finding expression in the thrill between lovers. It is also, as the speaker describes in “Consummatum Est,” the moment he believes he became infected with HIV: “Yes – certainly I felt it – and broke / into a sweat, the exact moment / the charge leapt from him to me.” Once we understand what’s at stake here, the layers of meaning become clear – the task of living and all its obligations, the attack made by the disease itself, the thrill of a lover and all its consequences. In this same poem, he compares the moment of the charge to that of women who look back and know the moment they conceived, and to the faith theologians have in what cannot be seen or proven. the exact moment they conceived. In this way he compellingly compares, and we are forced to contrast, the moment life begins to the moment that threatens his life. But it is faith regardless, and as with the mothers and theologians, that faith matters only to oneself. As death plays a part in each poem, so too does God. Always within the speaker’s consciousness, God is addressed by turns ironically, earnestly, and tenderly. It’s a God, he acknowledges, who seems not to listen or care, but whose existence is never questioned. Prayers, psalms, and incantations tie the book together. The speaker needs all of these as he confronts the ravages of ill friends, nursing them through sickness and sometimes into death, seeing himself in all of them. Suffused with an emotional and spiritual longing, the poems convey pain without seeming to expect anything to change. flexible, small and sweet to enter here…. this is not my door. but this is not my bed. on the bedside table, in front of the tissues and tulips. “Which are they?” he asked. We see here how even amidst the carnal he is aware of God, and how this awareness seems never to leave him. Moreover, there is a tone of gentle mockery or chiding towards either himself or God, perhaps both. It is because of this light touch that the poems about faith and God are never overwrought. Throughout the collection, the speaker works to come to terms with death, the death of people he knows – friends, lovers – and his own, which in many of the poems seems an imminent possibility. Men dead and dying of AIDS haunt the speaker. Hence, the charge to go on living, past others who have died and in the face of one’s own death. In writing about AIDS, Donnelly joins the likes of Mark Doty, Marie Howe and others whose poems relate their experience of losing someone to this disease. Here, though, we are taken that much closer, into the confidence of a narrator contending with sickness himself, teaching himself in these poems how to live with death on his shoulder. An ambitious book, the poems work towards transcendence even as they encounter despair. There is no graver subject, and yet never are the poems oppressive. Patrick Donnelly’s humor and humanity lift these poems up and shine a light in the darkest corners. Tara Gorvine received her MFA in poetry from the University of North Carolina, Greensboro, and she works as an editor at Edward Elgar Publishing. Tara's poems have appeared in Seattle Review, Cimmaron Review, and Greensboro Review.